You shouldn't need to be Sherlock to find application errors. Q1. How to format contents of file in single line using fmt? Q2. How to change maximum line width? Q3. How to make fmt highlight the first line? Q4. How to make fmt split long lines? Q5. How to have separate spacing for words and lines? Sometimes you may find yourself in a situation where-in the requirement is to format the contents of a text file. For example, the text file contains one word per line, and the task is to format all the words in a single line. Of course, this can be done manually, but not everyone likes doing time consuming stuff manually. Plus, that's just one use-case - the requirement could be anything. Gladly, there exists a command that can cater to at-least some of the text formatting requirements. The tool in question is dubbed fmt. In this tutorial, we will discuss the basics of fmt, as well as some of main features it provides. 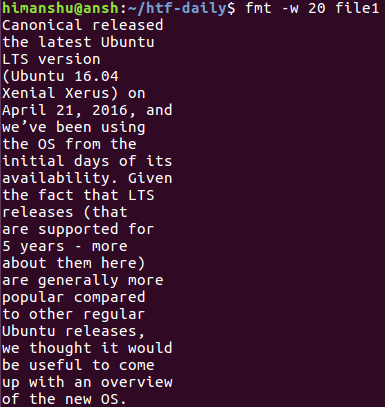 Please note that all commands and instructions mentioned here have been tested on Ubuntu 16.04LTS. Reformat  each  paragraph  in  the FILE(s), writing to standard output. The option -WIDTH is an abbreviated form of --width=DIGITS. Following are some Q&A-styled examples that should give you a good idea about fmt's usage. That's what the fmt command does when used in its basic form (sans any options). You only need to pass the filename as an argument. So you can see that multiple lines in the file were formatted in a way that everything got clubbed up in a single line. Please note that the original file (file1 in this case) remains unaffected. By default, the maximum width of a line that fmt command produces in output is 75. However, if you want, you can change that using the -w command line option, which requires a numerical value representing the new limit. This can be done by making the indentation of the first line different from the rest, something which you can do by using the -t command line option. The fmt command is capable of splitting long lines as well, a feature which you can access using the -s command line option. Note that this feature was enabled by default in our case. Agreed, fmt offers limited features, but you can't say it has limited audience. Reason being, you never know when you may need it. Here, in this tutorial, we've covered majority of the command line options that fmt offers. For more details, head to the tool's man page. There is nothing wrong with a tool that does one thing, well. Especially if it behaves as a filter.